After doing the battery upgrade the sound was even weaker. My solution was to salvage the piezo element out of an old unused Casio Data Bank and place it on the back of the battery pack. Originally I thought that other locations would be better for this piezoelectric element but the back of the battery produced the loudest sound, even while wearing the wrist PDA. After doing the upgrade the sound appeared to be over 4 times louder than an unmodified unit! Warning: The following modification requires delicate soldering skills on surface mount devices. A mistake can damage your unit or harm the sound circuit. With an oscilloscope I discovered the largest signal came from the lower right pin of a surface mount device (SMD) near the right of the built in piezo device. See the following picture. (I do not have a schematic so I don't know if it is a FET or what.) Because I was placing an additional piezo device outside the Fossil's case, a capacitor was used to block DC and a resistor to limit current in case a short occurred. The large can is the built in piezo speaker, the signal comes from the device to right of it. The wire from the 470 ohm resistor is run out of the back of the case through a drilled hole, and epoxied in the hole to keep it in place. On the outside I soldered the wire to a thin lead going to the piezo disc. 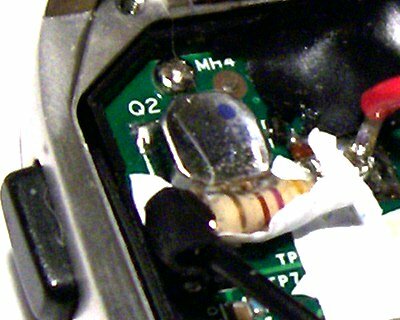 The other thin wire lead of the piezo disk was wrapped around one of the cover screws. The piezo disk it's self was glued with a little contact cement then covered with a layer of clear boxing tape. See the thin lead wires going to the top of the Fossil PDA. After the modification the sound appeared to be over four times louder! It seemed as loud as my OnHand wrist PDA and my alarm watches. Now that I have decent battery life and sound, I am interested in better applications and games. I will also try to make a better hard plastic cover for the wrist PDA screen. My last plexiglass cover stuck on with velcro and was harder to use than I liked. About me on KD8CIK.com or Hamdomain.com main page. See my problems surviving with a socially unwanted handicap. © Copyright 2006 - Michael Lake - Make copies for personal use only.